如果只是按 ICH7的 Programmer’s Reference Manual 在 Page 125 頁所描述的S3 Resume BIOS Requirement仍然不足, 需要透過其GCTRL Register 將整個Codec 整個在 reset 一次才能正確的列舉在HDAudio Host Controller 上的各codec. Set CRST/GCTL bit, exit reset. Open Regedit on Windows XP SP1 and later version. You can to modify the PinConfig Value to change Audio device setting to verify something when developering Audio Driver/Testing WHQL. Microsoft HD Audio Pin Configuration Implementation Test Procedure Guidelines. update the message from uaa@microsoft.com, Microsoft HD Audio Tool for Win7 only now. You can get a public version that works with Windows 7 at http://www.microsoft.com/whdc/device/audio/HDaudio_tool.mspx. It’s tied to Windows 7 because we included driver features in Windows 7 that are necessary for the tool to work, and that let us post it publicly. You must use the Windows HDAudio drivers when using the tool. PS. 之前是解Windows Mobile Loge Test Kit Issues 現在換成解 Windows Hardward Quzlity Labs Testing. 不知道有沒有殺蟲執照可領? 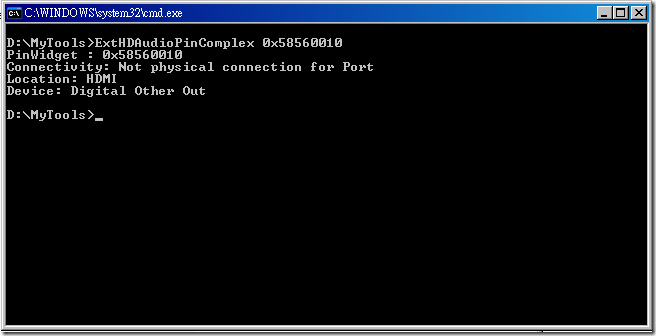 而該pin configuration value 就是 0x58560010了, 透過該Configuration 的格式去解出該pin 實際的硬體電路狀態, 但這里並沒有將 32bit 格式全部解出, 只解出跟電路構成有關的部份! 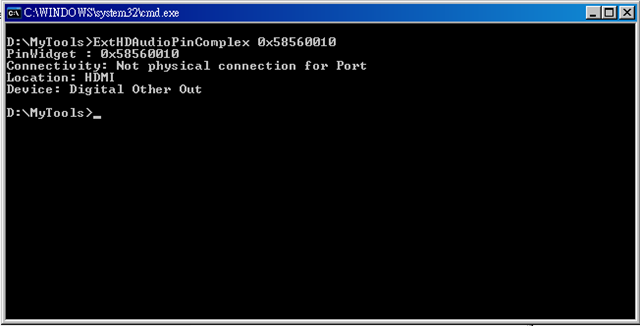 // ExtHDAudioPinComplex.cpp : Defines the entry point for the console application.